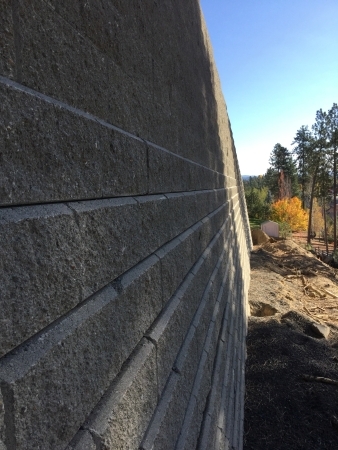 The design called out for a big wall block and Raab Enterprises used out Big Rock Block. He had used it before and knew it would work well for this project. 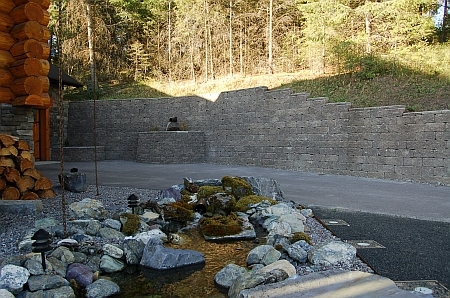 The area that was created is for capturing the site rain water from the parking lot above and from the retail building. 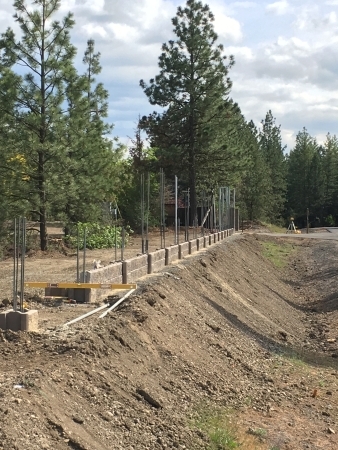 The water is directed to the swale area that was creating using the block. The 3rd Street Retail project had a grade change at the side walk. 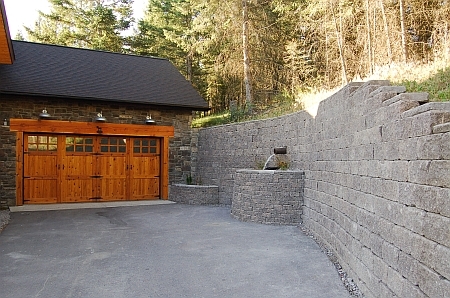 Instead of using a plain concrete wall, they decided to use a stone veneer. 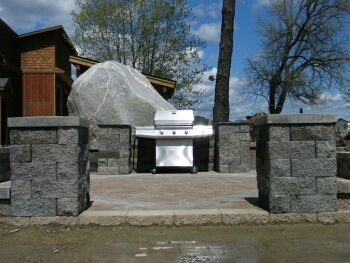 The product selected was our Selkirk Stone Fieldstone in the Black River color. 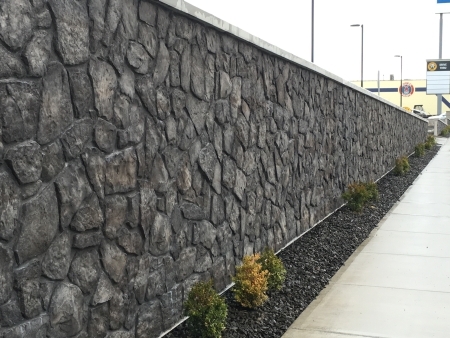 They were wanting a stone that had some of the characteristics of the old rubble basalt that can be found in the area, but in a more modern look. 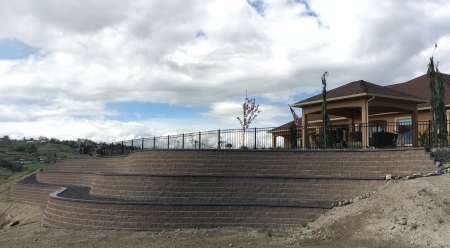 Melvin at Elite Hardscapes was approached by a customer to build a security fence. 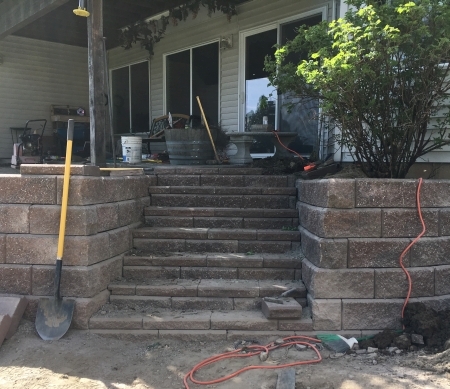 After negotiating a deal, Elite Hardscapes put the crew to work. 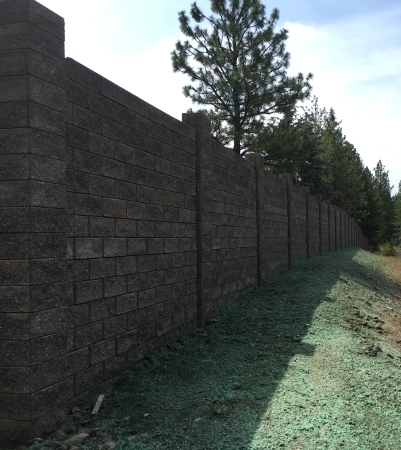 With over 900 lineal feet of fence, they built up the base, installed the concrete piles and stacked & grouted the 1st phase of posts. 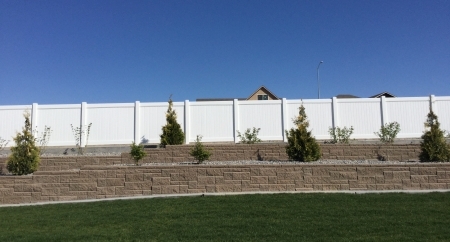 They leveled the base between post and stacked in the AB Fence Panels. Then stacked and grouted the posts to height. 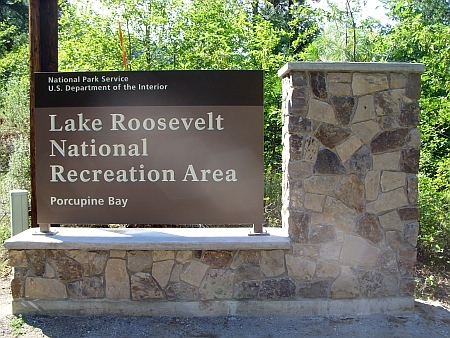 Once all the posts and panles were in, the final phase was to install the caps. 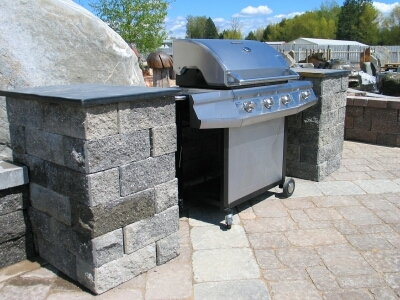 While presenting a DIY, we built this BBQ Workstaion to show off the versatility of the Courtyard product line. 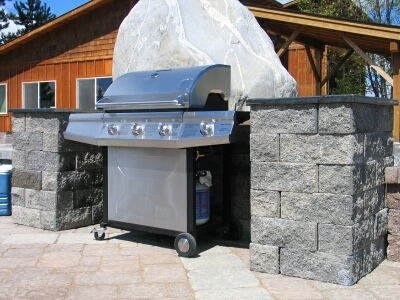 The BBQ Workstation creates a great space for prepping food and provides more work area when using your gas grill. 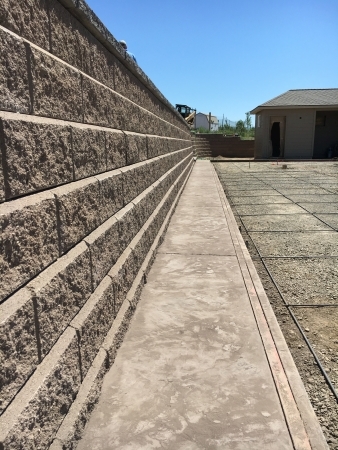 Kreiger Konstruction, LLC had a customer with a sloping yard that they wanted to level out and create more usable space. They leveled out a parking area and spot for a tractor shed. The owners also wanted something that would bring their family outside more. 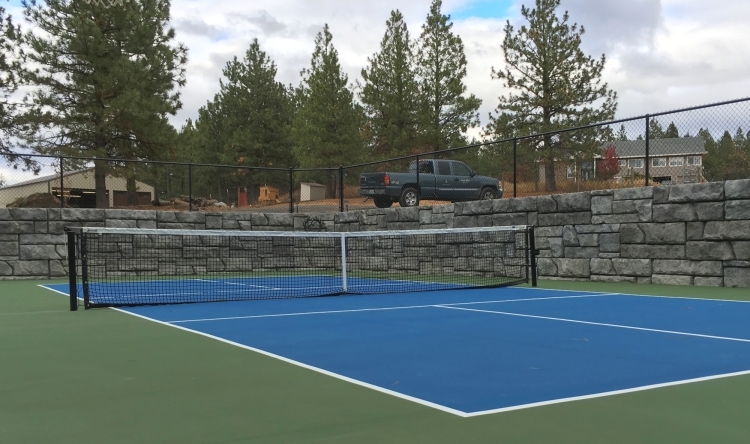 After bouncing a few ideas back and forth, they came up with a plan for a retaining wall that would help create the area for a pickle ball court. The space that has been created has this family outside, which is what they enjoy. 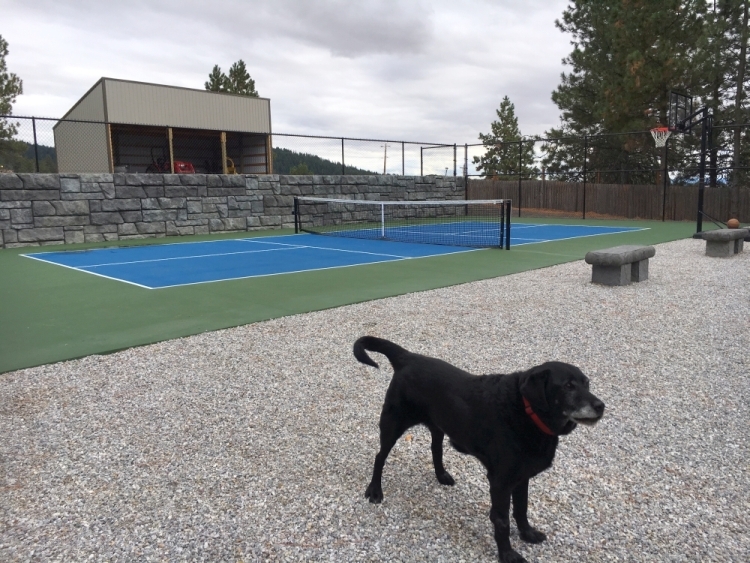 Even Lucky, the family pet, likes the new play area! The property owner was looking to make land management a bit easier. 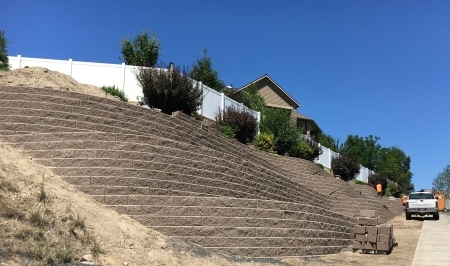 The weed maintenance and sloping hillside were difficult to overcome. 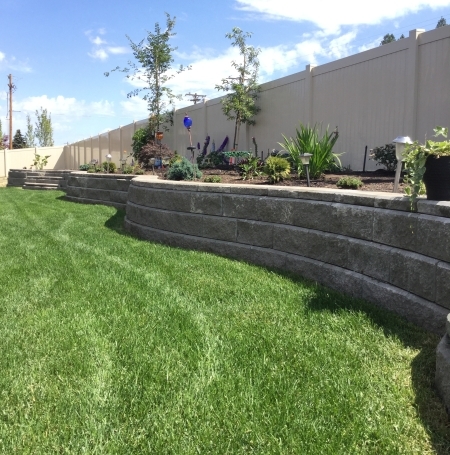 After speaking with Jeff at LC Lawn & Hardscapes, they devised a plan to create a multiple terraced wall. 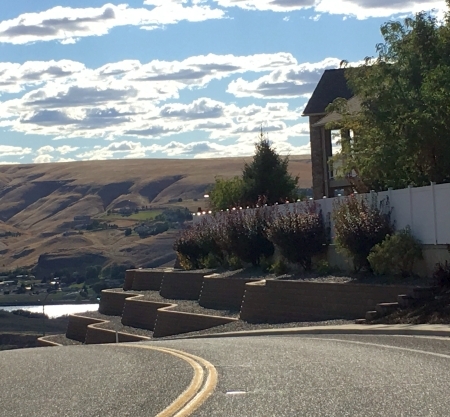 The wall is level at the top of each terrace and the bottom steps up following along the roadway grade. 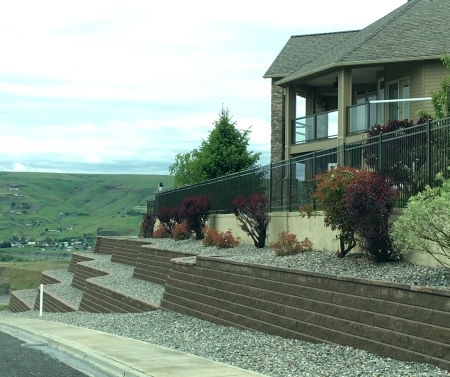 The long range plan is to plant in the terraces with flowers that need minimal care. 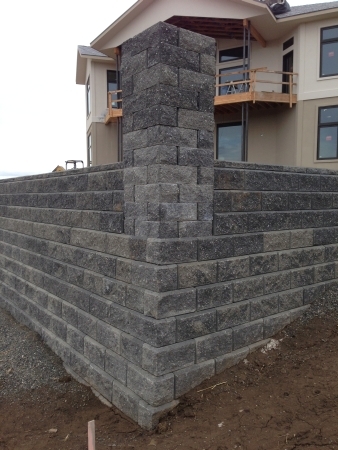 LC Lawn & Hardscape has a knack for building Allan Block Walls. 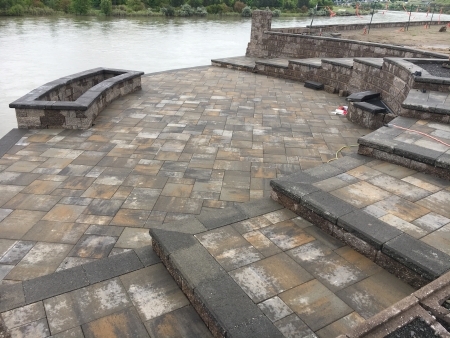 This project gave them an opportunity to cut their theeth on the AB Ashlar product line. The overall effect is dramatic and fitting to the home. 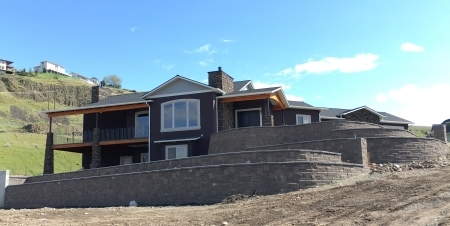 Elite Hardscapes & Sprinklers and Joy Hardscapes & Dirtworks teamed up on this project. 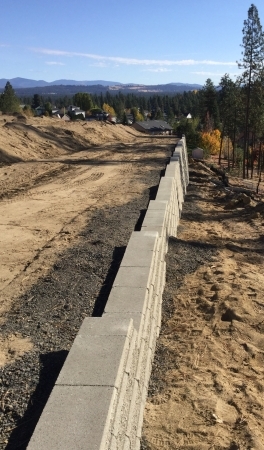 With over 4000 Allan Block Retaining Wall units, it was an extensive project. 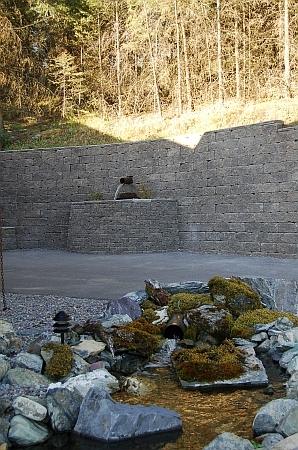 It was a negotiated project that was competeing with other wall systems, including boulders and big block walls. 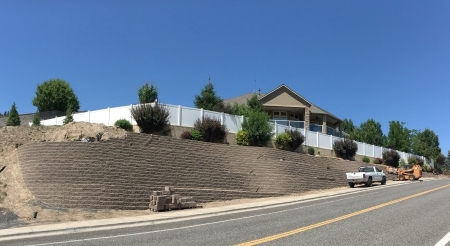 Time was critical since the developer of the property, Mountain Crest, was working on the infrastructure of the site to create new home lots. 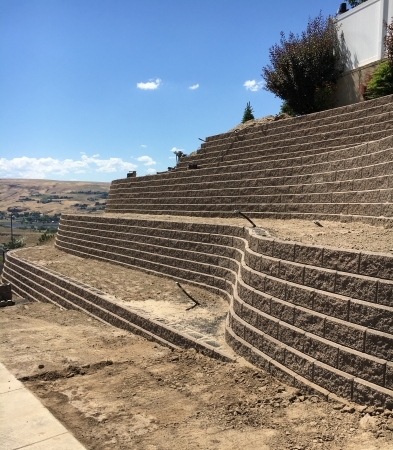 Melvin, owner of Elite Hardscapes, spent the 1st week and a half working on the layout, compacting the base rock, creating the step ups at grade the changes and keeping the wall layout in a straight line up the hillside as the base stepped up the hillside. 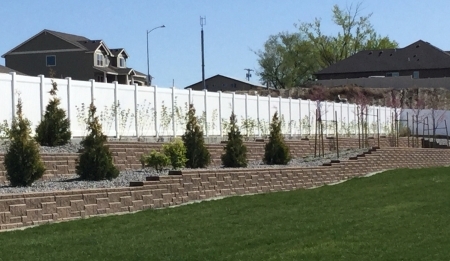 Once the base courses were established, Melvin brought in his crew and Joy Hardscapes & Dirtworks to install the rest of the wall to height. 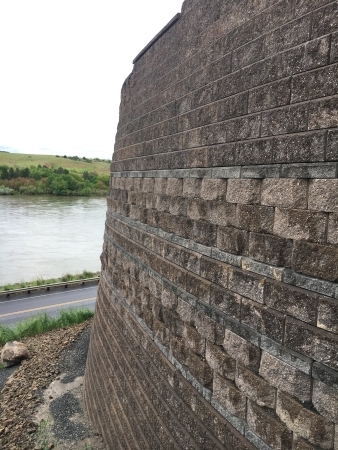 At just over 18' at the tallest point and 2' at the shortest, this wall had many challenges that they were able to overcome. 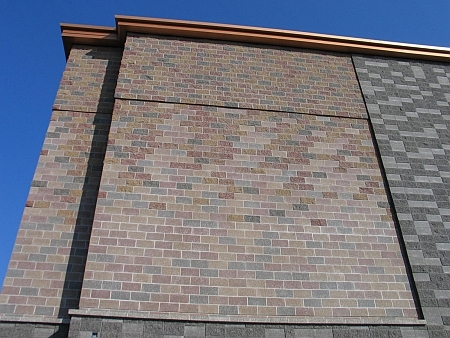 Paul Nelson of Inland Pacific Engineering Company (IPEC) was the wall designer for the project. 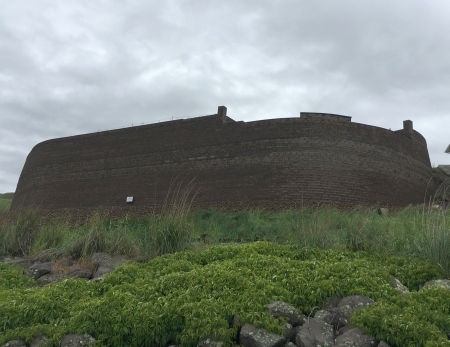 The wall utilized grid lengths up to 14' in depth at the tallest part of the wall. The grid was spaced every 24" creating a substantial composite mass. They delivered the project on time and on budget for the developer. 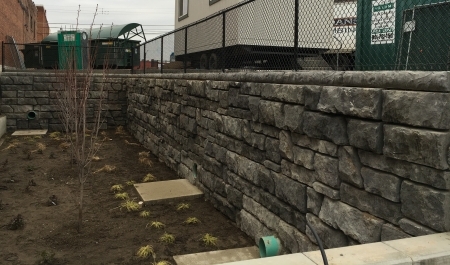 The project was specified with Allan Block Ashlar as the retaining wall block. 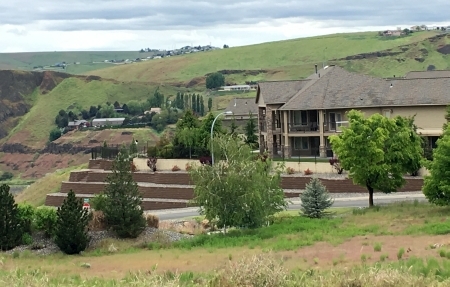 We worked with or dealer in the Tri-Cities area, HD Fowler, and they quoted the project to their landscape contractors. 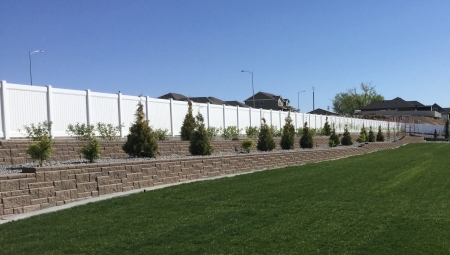 Once the project was bid and the landscaper was selected, the Architect chose our tan color for the job. 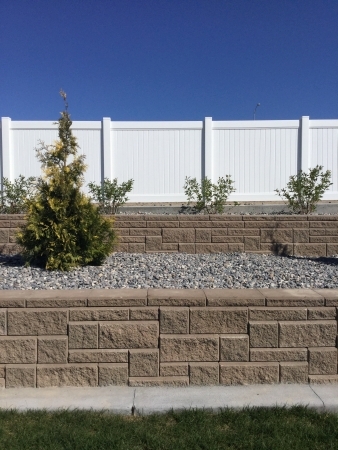 It was a bit of a learning curve for the landscaper, they had never done an Ashlar wall before, but they were able to put together a very nice looking wall. 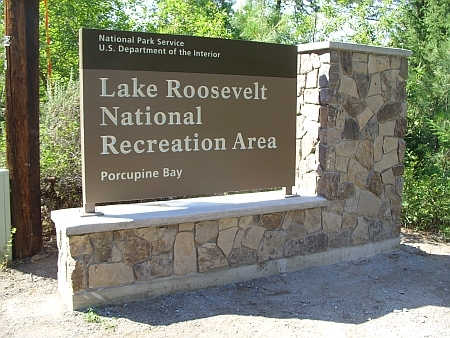 The Washington State Parks Department wanted a Natural Stone for their new signs. 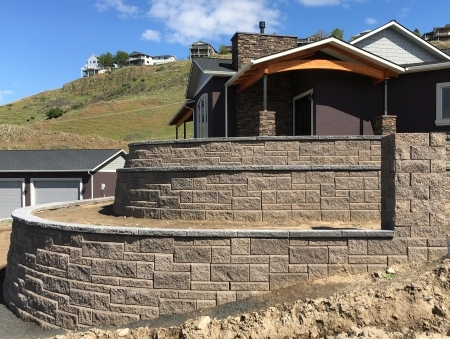 The Telluride Ticino (pronounced te-chee-no)Thin Stone Veneer fit the requirements. 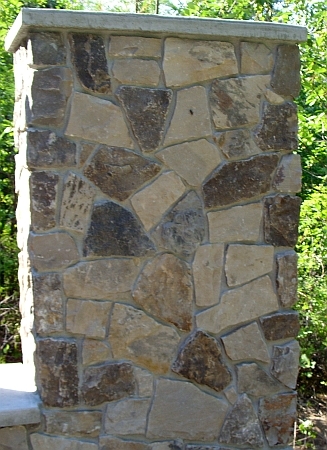 Because it is a natural stone, it offers the beauty and durability that only nature can provide. There wont be any fading or discoloration. If it does get a chip, it won't stand out like the other manufactured veneers. 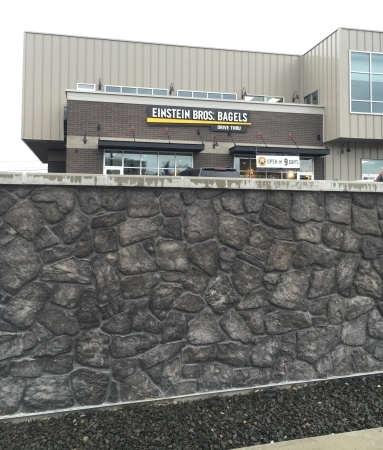 This is one of 4 sign projects that Jeff built using the Telluride Natural Thin Stone Veneer. 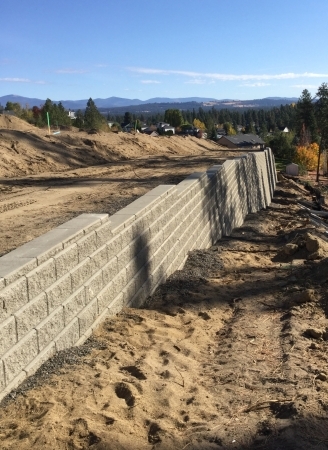 Here are a few pics of projects that have used the Allan Block Retaining Wall System for their application. Maybe there is something here that will hep you with an idea for your project. There is always another way to get the block to the jobsite! Gabe Langberg with Earthscape Landworks had a small project on the lake that did not have good access to where he needed to work. 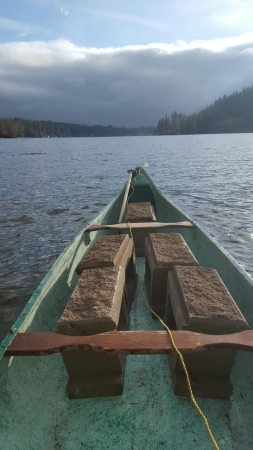 He decided to try his trusty canoe and get a work out too! 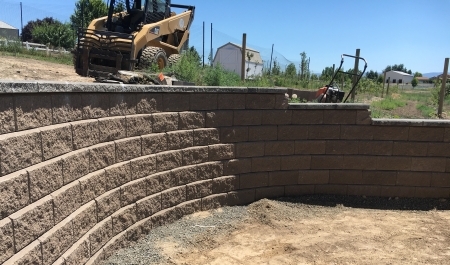 After a few trips, each time adding just one more block, he had what he needed and was able to complete the job! This project was in design for a while. The owner developing the property was building an apartment complex on the upper area of the land and it left a nice space for retail development. 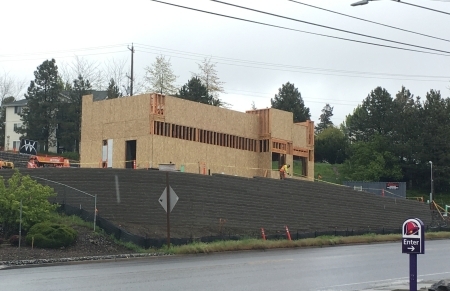 Starbucks negotiated a lease and the construction began. Scott Becker of Hodge & Associates knew Allan Block was a good choice for the site. 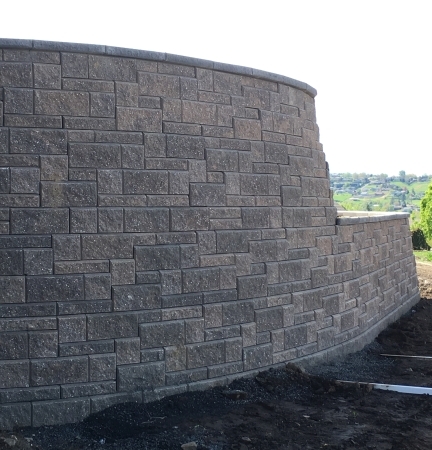 The 12 degree set back of the Allan Block Stones helped to create a strong reinforced zone behind the wall that will be supporting the drive thru and parking area. 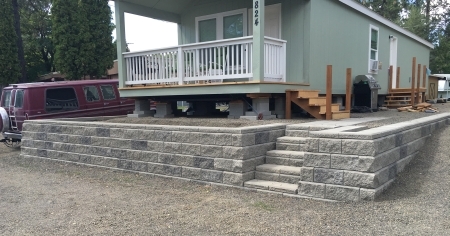 Precast Bench Top � Slate texture on top and 4 sides. 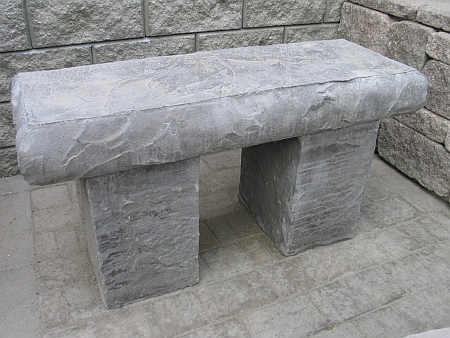 The Bench Base pieces also have the slate texture on 4 sides. 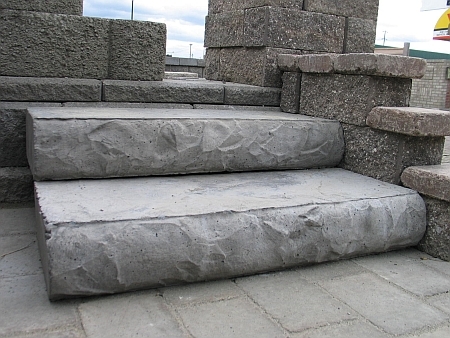 The Precast Steps have a Slate Texture on the top and front face of the step. 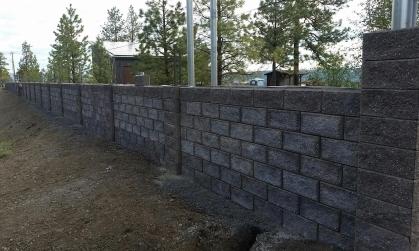 # P7022 is 36�wide x 6� tall x 35� deep with the Slate Texture on top, front and back. 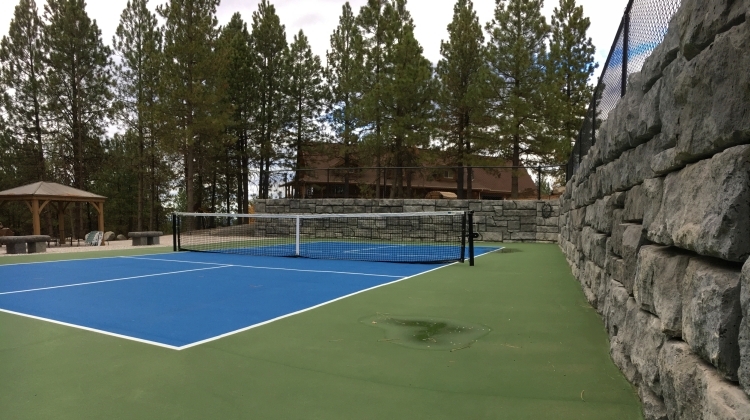 # P7030 is 48�wide x 6� tall x 35� deep with the Slate Texture on top, front and back. NIck's Boots new retail location has a warm comfy feel, just like their boots! They have an extremely nice waiting area that encompasses a gas fireplace and comfortable chairs. 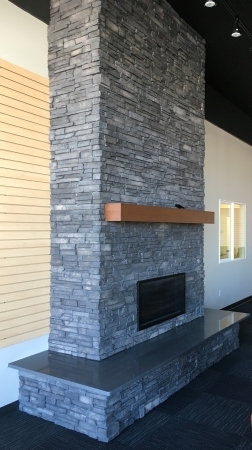 Surrounding the fireplace is our Selkirk Stone - Northern Ledgestone in the Black River color. 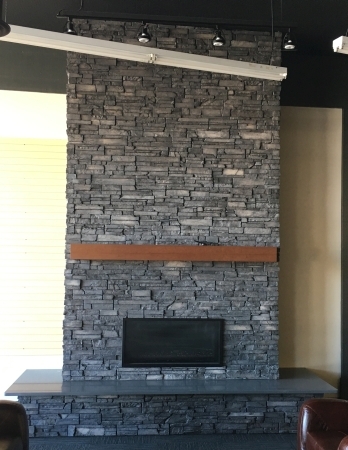 The stone has a nice contemporary look and the dark color is a great accent to the waiting area's other features. 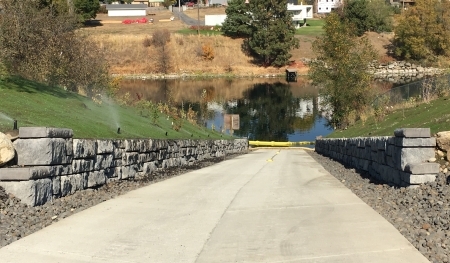 A small community needed to update their boat launch and worked with Howard Raab of Raab Enterprises to build it. 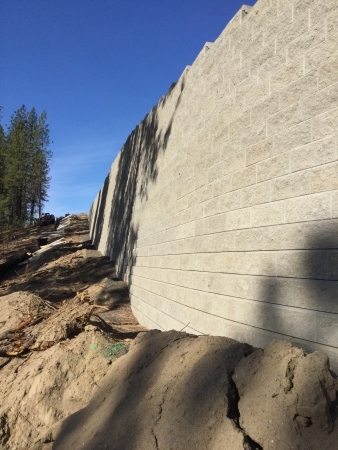 Raab used our Big Rock Block for the retaining wall leading down to launch at the river. 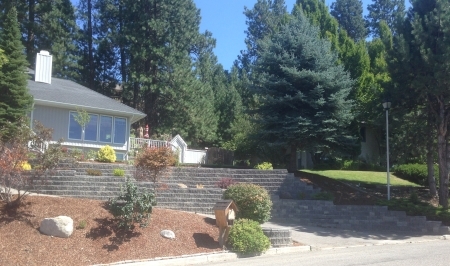 Jeff from LC Lawn and Landscape worked with the owners to develop their property to the fullest. 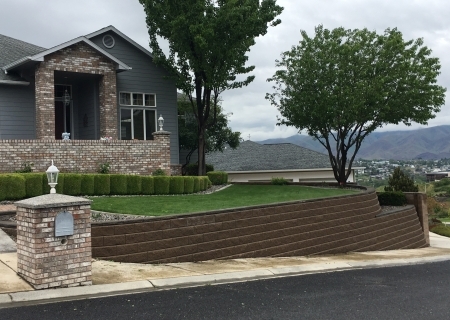 By adding the wall, they added more backyard space that over looks the river. 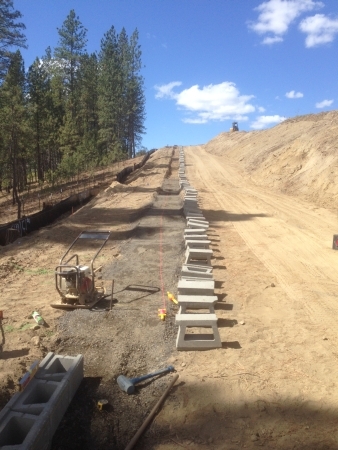 At over 22 feet tall, the project needed engineering, which was handled by TD&H in Lewiston ID. 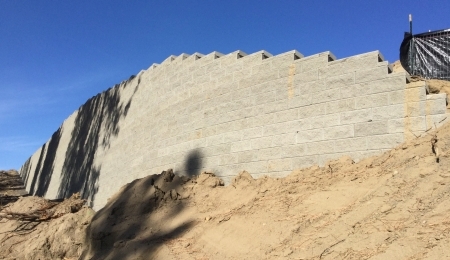 They designed a wall that gave the owners the space they required and once it is completed, it will support the footprint of the home that will be built. 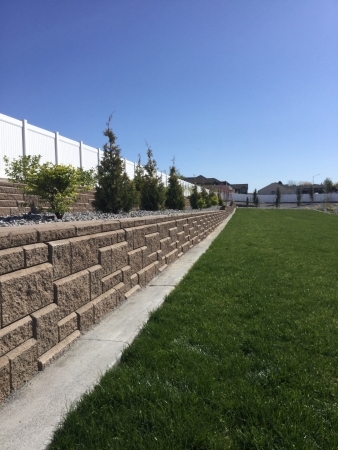 The use of the AB Classic as the main portion of the wall, along with the AB Lite Charcoal color with the 3 courses of AB Rockface between, is a nice way to accent the wall without adding a lot of costs. The top lip bottom notch of the AB units allows for a seamless transition with the different block faces. 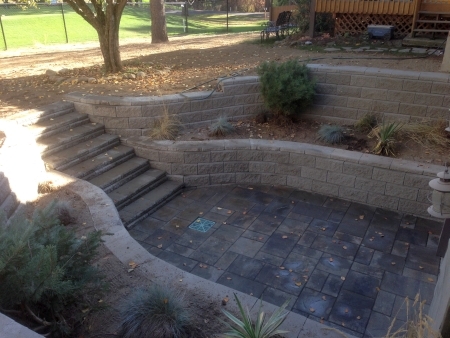 The wall added space for a paver patio that includes stairs and a firepit for the owners to enjoy. 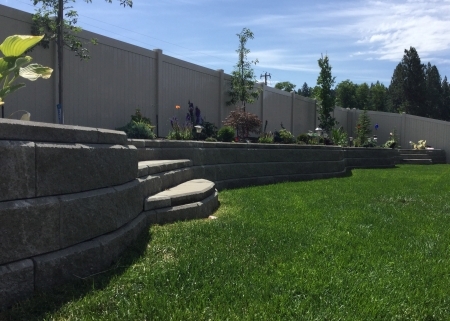 Gabe at Earthscape Landworks worked with the homeowner to find a solution for flooding in their basement. 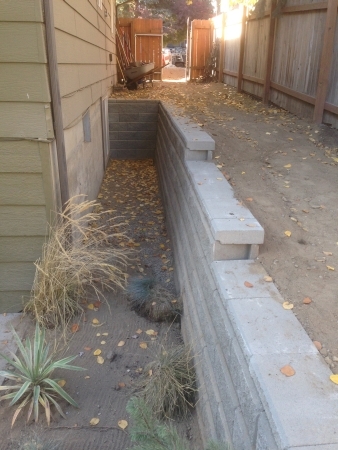 He installed a catch basin and french drain along the house foundationand redirected the water flow at the side of the houe. 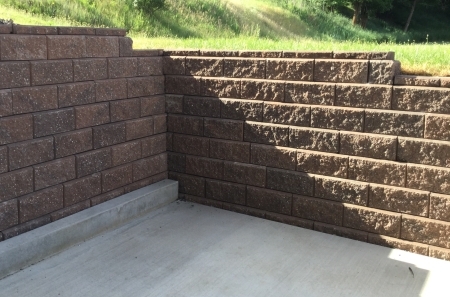 He also installed a nice paver patio and used our Allan Block Retaining Wall to recreate the sunken patio area. 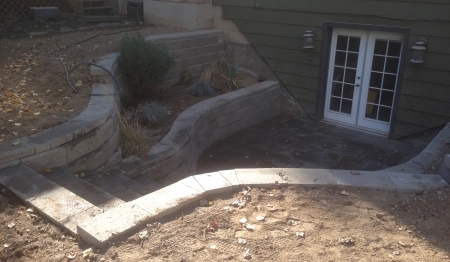 Jeff at LC Lawn & Landscape worked with the homeowner to provide a leveled back yard living spce. 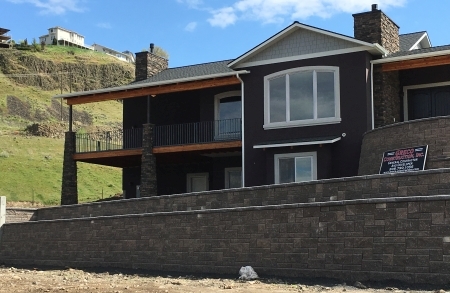 The use of terraced walls to get the overall height that was need only adds a look of ellegance to this project. 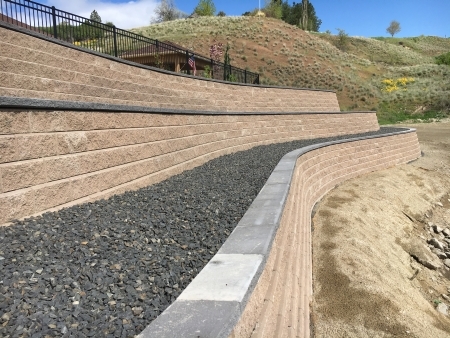 The curving design of the wall softens the landscape, and the earthtone colors of the block with the charcoal caps accent the building site and the home that sits above. 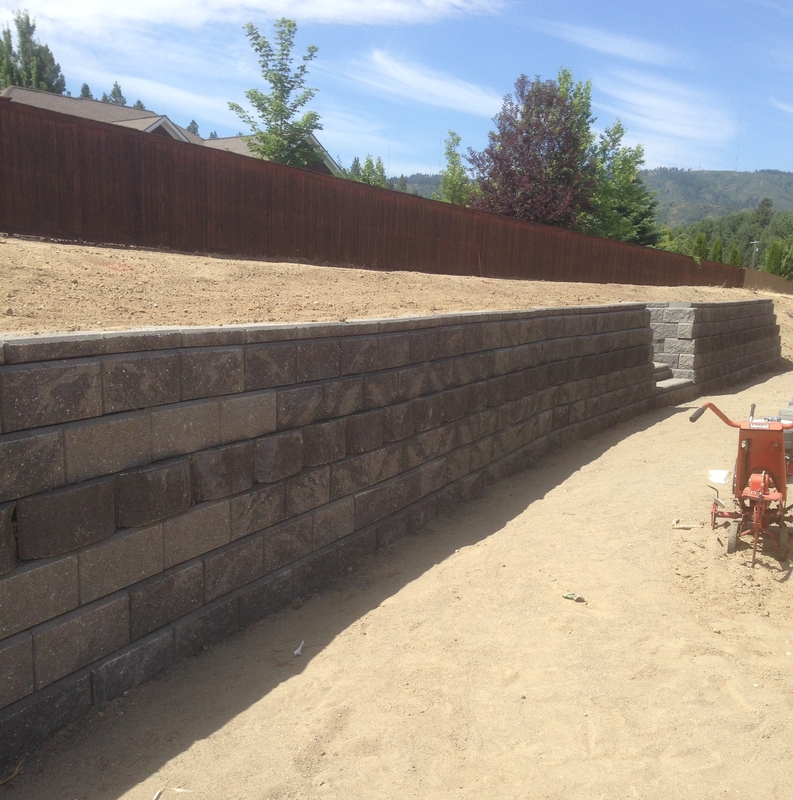 We had a customer come in that needed a retaining wall block. 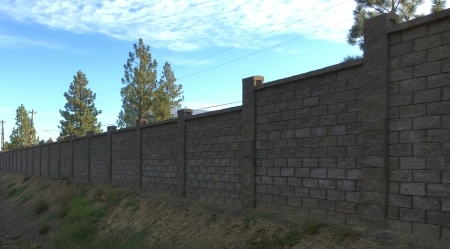 He had done his homework and wanted to use the Allan Block Wall System. Heliked the AB Classic Shadow, but wanted to do something a little different. He had a budget, and was looking for options that kept him within the budget. Rick mentioned that we have the AB Rockface available in Tan or Charcoal and he could use it as an accent course. The customer liked the idea and ran with it! Ben from Jammin' Enterprises had attended one of our Allan Block Certification Courses and hasn't looked back since. 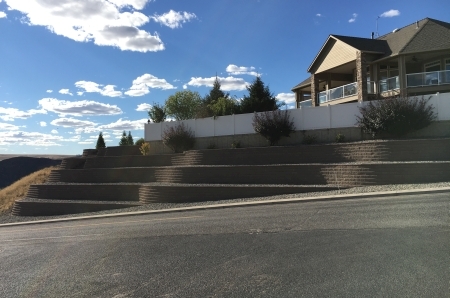 He and his crew installed this residential wall utilizing some stairs and curves to create a nice looking planter area. 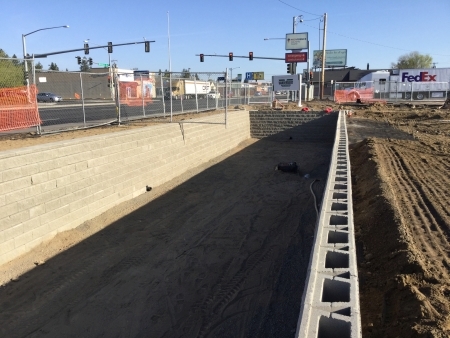 The project called out for a Segmental Retaining Wall System for creating the site water swales for the new Rite-Aid store at the Franklin Park Mall. 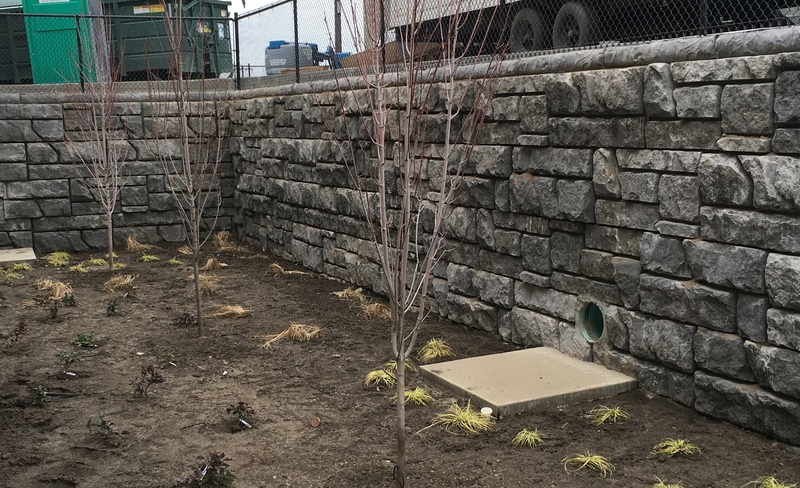 There are 2 independent swale areas that can handle the volume of rain water from both the parking lot and the building. 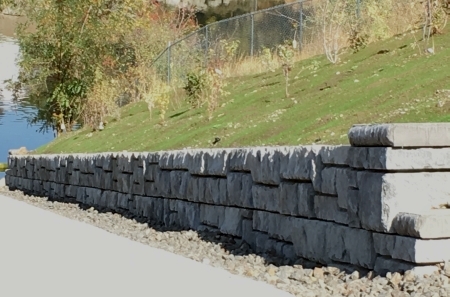 The pipes that feed water to the swale from catch basins had to be cut throught the face of the Allan Block. 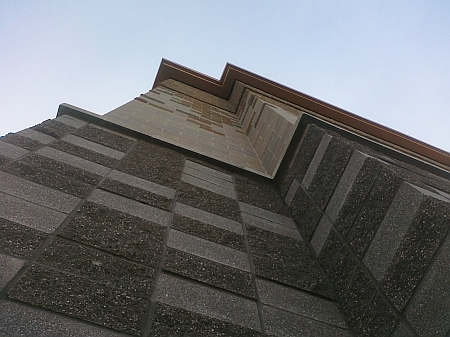 Because of the overall heights of the walls, engineering was required. 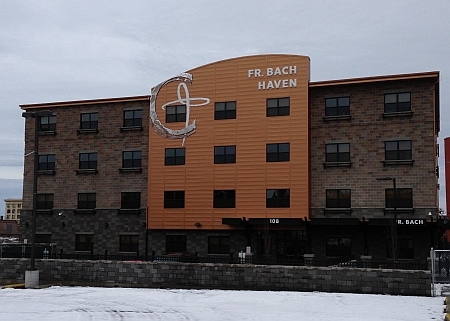 There are over 4200 Allan Block units installed on this project. 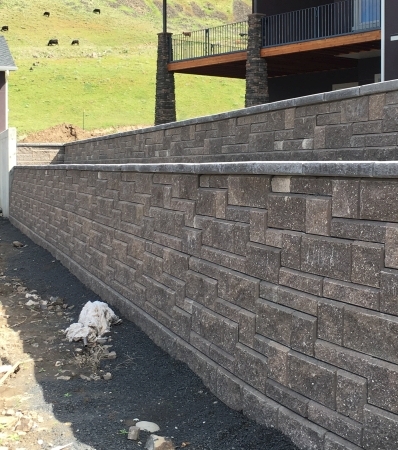 This project uses splitface and groundface cmu block. 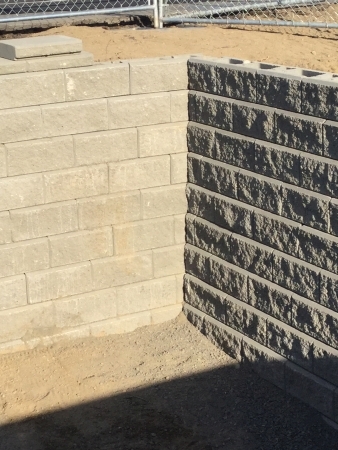 There are 4 different colors that we preblended in our yard for Spilker Masonry before delivery to the jobsite. There are both structural 8" CMU units and 4" Veneer CMU units used throughout the project. 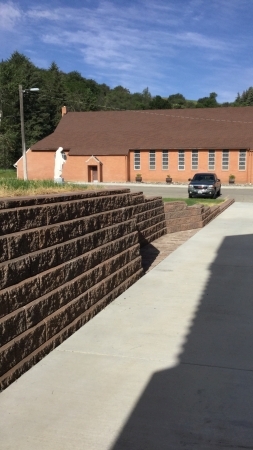 The church needed a retaining wall next to the building to help create a patio area for a BBQ and outdoor eating area for the summer. They gathered the donations to buy the materials and had a group of volunteers to do the installation. 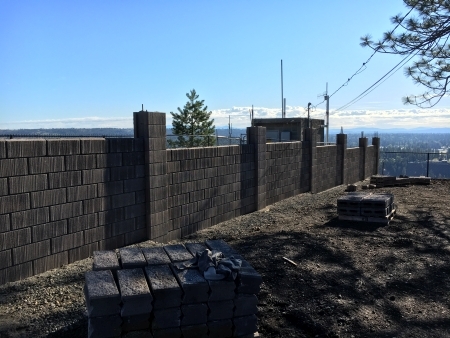 They were led by a contractor that had some wall building experiance, and we were able to answer all of his questions before they started. They did a great job and should be proud of the work that was done.